1. Cover and simmer beef in 1-½ cups water for 45 minutes or until tender. Add more water if needed. 2. Drain the broth, but reserve ¾ cup of it. Put back the beef in the pan and pour in reserved broth. 3. Add in the potatoes and sibuyas Tagalog. Cover and simmer until potatoes are half tender. 4. 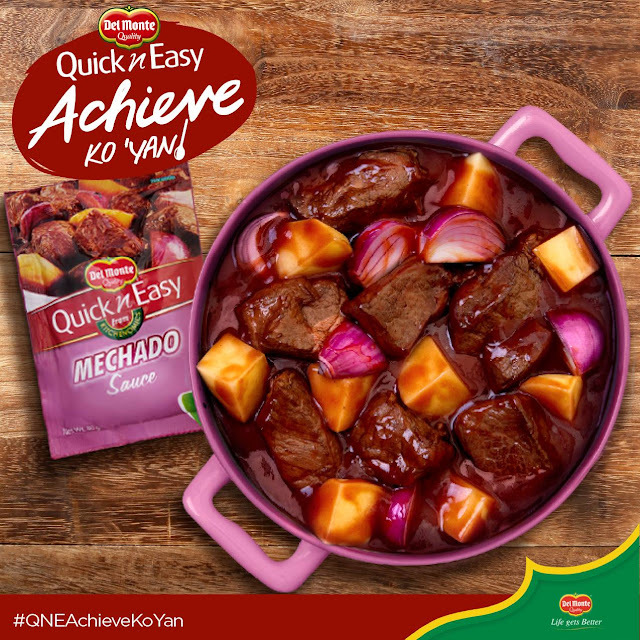 Add DEL MONTE Quick ’n Easy Mechado Sauce, season with ¼ tsp fine salt and 1 tsp sugar. 5. Cover and simmer over low heat for another 10 minutes. Serve.